Since his recording debut as CHOIR BOY in 2016, ADAM KLOPP mined a sound swirls 1980s synth noir with captivating, cinematic songs sweeping with pensive sorrow and glowing hope. As a former member of the Mormon faith, Klopp spent his youth both in the pews of his place of worship, but also churning through DIY punk venues, before leaving the sect in the thick of a mission in Tahiti. The duality of faith and fiction are central to the lush explorations on his debut album Passive With Desire. Recorded at Studio Studio Dada, the album’s tracks permuted as bedroom sketches, awash with camp, the sting of loss, and allusions to halcyon days of nocturnal, electronic driven pop. Retaining elements of Klopp’s original demos, Passive With Desire was recorded with a full band and polished with trumpet, strings, as well as archival samples calling back to Klopp’s hazy youth. Engineered by Klopp, BRET MEISENBACH and STEPHEN COPE, Passive With Desire is the entry point to Choir Boy’s world of emotive wit, novella kissed lyricism, and bouncy, synth-forward takes on traditional song writing bound by the universal themes of loss, desire, evolution, and exploration. 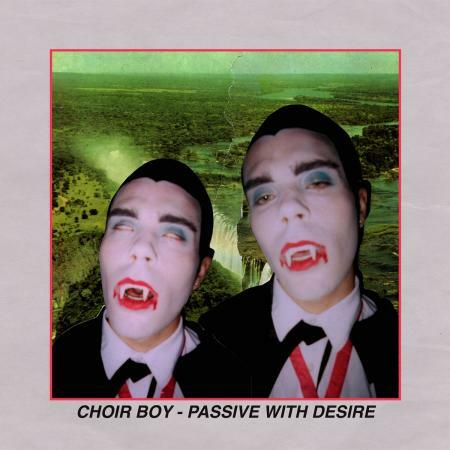 Now available for the first time in a wide release, Passive With Desire is a proper introduction to Choir Boy’s unique brand of storytelling, orated by Adam Klopp’s full, rangeful vocals. The expanded CD version comes with a 12-page lyric booklet, and combines the album, Passive With Desire, along with seven bonus tracks, including the Sunday Light 7’’ single and live studio session tracks from the limited edition Part Time Punks cassette. The repackaged LP edition comes in a sturdy matte jacket with matte Eurosleeve insert and lyrics.